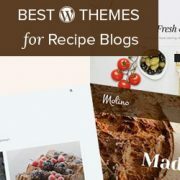 Are you looking for the best WordPress themes for your recipe blog? Traditional blog themes lack the imagery needed to make your recipes stand out. 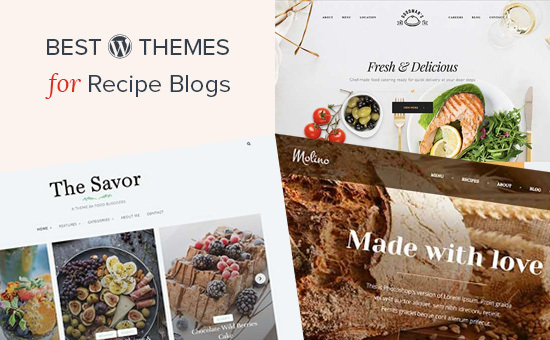 In this article, we will show you the best WordPress themes for recipe blogs that you can try right away. WordPress is the most easy to use website builder in the market. It is perfect for sharing recipes and creating engaging food related websites. There are two different types of WordPress available. WordPress.com, which is a hosted platform built on top of WordPress, and then there is WordPress.org also known as self hosted WordPress. For details, see our comparison of WordPress.com vs WordPress.org. We recommend using self-hosted WordPress.org because it gives you access to all the powerful WordPress features right out of the box. You will need a WordPress hosting account and a domain name to start your own self-hosted WordPress website. We recommend using Bluehost. They are one of the largest hosting companies in the world and an officially recommended hosting provider. They have agreed to offer our users a 60% discount, a free domain, and a free SSL. A deal that you won’t get elsewhere. After purchasing hosting, you can go ahead and install WordPress. Follow our guide on how to start a food blog for step by step instructions. Once you are all set up, it is time to choose a theme for your website. 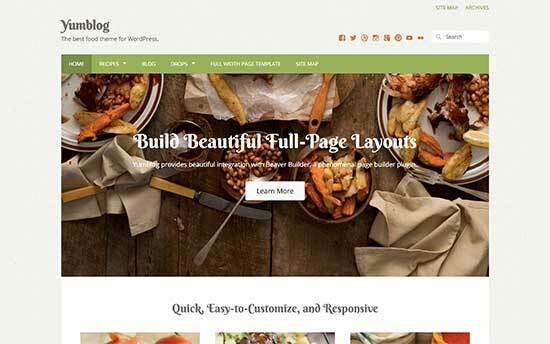 Let’s take a look at some of the best WordPress themes for recipe blogs. Note: This list has both free and paid themes and all of them are mobile-responsive. 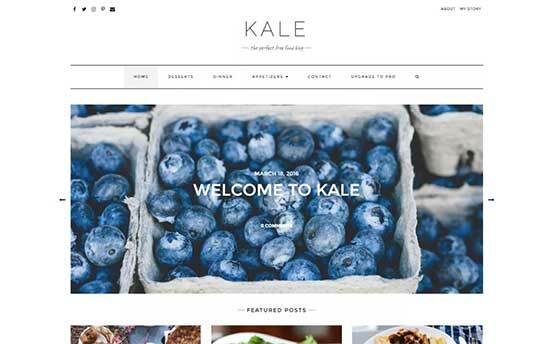 If you are looking for a free, clean, and simple recipe theme, then take a look at Kale. This minimalist style WordPress theme features a traditional blog layout with all the basic features. It comes with a special front page showcasing featured posts and a large highlight post. It also has the option to show a banner or a posts slider in the header, and includes full ecommerce and RTL support. 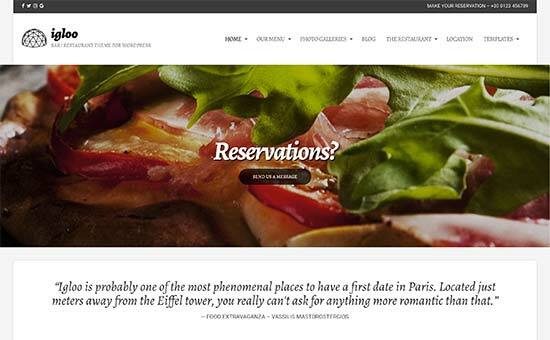 Gourmet is a powerful WordPress theme for food blogs, recipes, and restaurant websites. It is part of a larger pack of 23 ready-made websites that can be installed with 1-click. Each template is fully editable using an integrated drag and drop page builder. It includes multiple WordPress sliders with different styles, multiple layouts, unlimited color choices, and more. It is super easy to use and includes a powerful theme options panel to setup your website. Igloo is another flexible and beautifully designed WordPress theme for a recipe blog, restaurant, or cafe. It features a beautiful modern design, elegant photo galleries, and built-in social media integration. 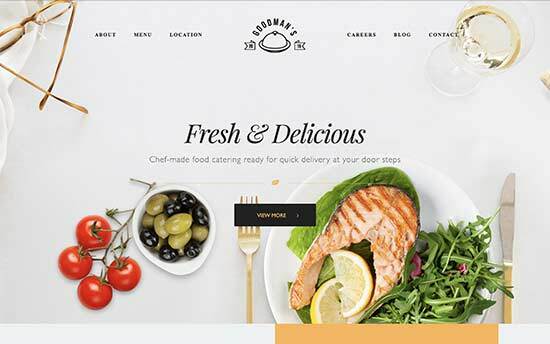 For restaurant websites, it has a menu management system and testimonial sections. It comes in multiple color schemes and you can change colors for individual pages as well. All theme options are easy to configure using theme customizer with live preview. 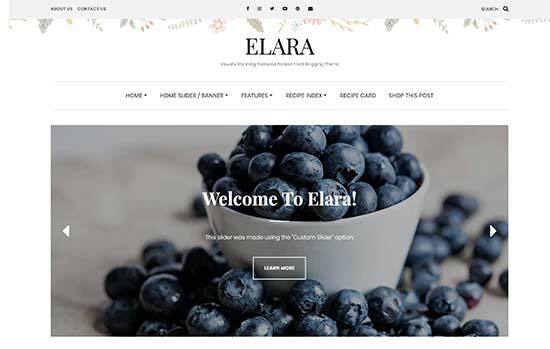 Elara is an elegantly designed WordPress food and recipe blog theme. It features a clean and modern design that makes your content more readable, and images more engaging. It comes with recipe builder, recipe template, and recipe index and filtering features. It has built-in support for displaying ads or promoting your own content. It also includes a beautiful front-page with featured posts section. 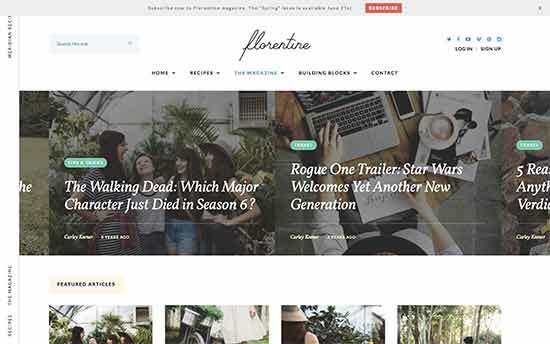 Florentine is an elegant and stylish WordPress theme for food and recipe blogs. It includes a dedicated recipe section allowing you to easily add properly formatted recipes to your website. Your users will also be able to instantly switch to the distraction free cooking mode. It has built-in social sharing, easy customization, different styles and layout choices. All theme options are neatly organized under theme customizer which makes it quite easy to set up and use. 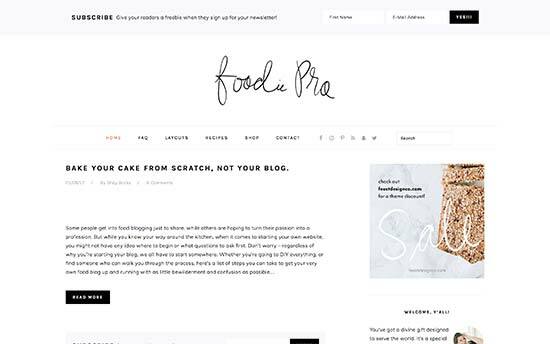 Built on Genesis theme framework, Foodie Pro is a well crafted WordPress theme for recipe blogs, food websites, health and nuitrition related niches. It features a fully widgetized modern layout allowing you to drag and drop items to setup your website. It includes a custom theme options panel, live customizer support, custom headers, multiple page layouts, and more. It is highly optimized for speed and performance. 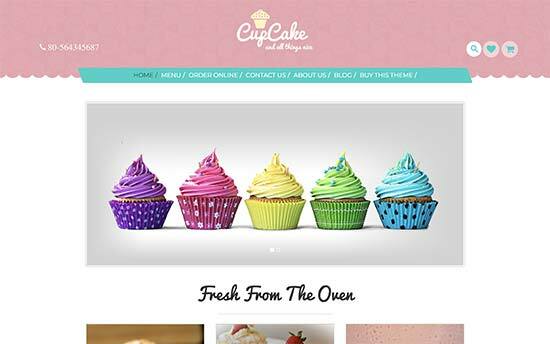 CupCake is a stylish and cute WordPress recipe and food blog theme. It comes with a unique design that utilizes fun color schemes and a modern layout for presentation. It includes drag and drop elements to setup your homepage. Inside you will find sections to add portfolio items, featured products, sliders, and call to actions. It can also be used to add an online store to your website. 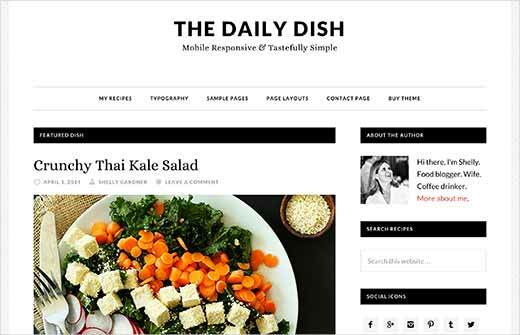 Daily Dish is a modern WordPress theme for food and recipe websites. It is built on Genesis, and features a two column layout with a focus on beautiful typography and elegant display of images. It comes with an easy to use theme options panel, customizable header, multiple page templates and widget ready areas. It is eCommerce ready and can be easily used to add a shop section to your website. 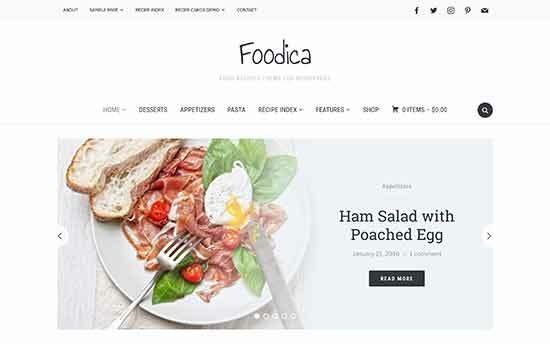 Foodica is a beautiful magazine style WordPress theme for food blogs. It features a modern design and comes in 6 color schemes to choose from. It includes easy to use shortcodes to add recipe ingredients into your articles. It includes dedicated sections to display ad zones and banners to make money online. It includes a simple theme options panel and full live customization support. 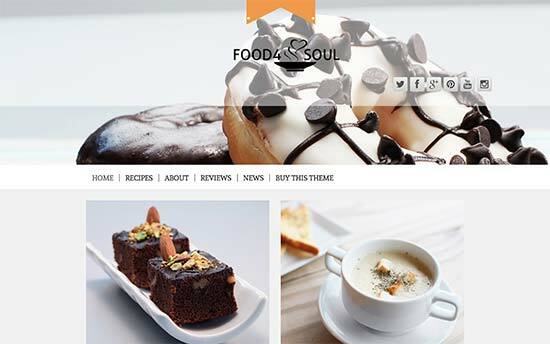 Food4Soul is another excellent option for a WordPress food or recipe theme. It features a modern design with a large header image on top followed by your social profiles and navigation menus. It includes drag and drop elements to setup your homepage layout. Inside you will find easy sections to manage portfolio, add recent posts, contact form, Google Maps, and more. It is easy to setup and includes a custom theme options panel. Narya is a magazine style WordPress theme for food and recipe websites. It comes with a dedicated recipe post format and a custom recipe plugin. It also comes with a premium slider and a layout builder plugin. Other notable features include 6 homepage layouts, 6 gallery layouts, multiple header styles, custom colors and more. It is easier to setup and all theme options are neatly organized. 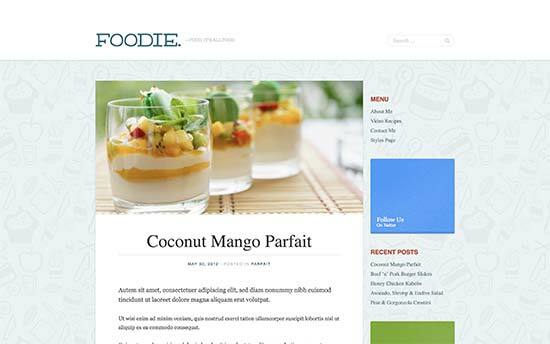 Foodie is a WordPress theme built for chefs, food bloggers, and recipes. It includes a recipe post section with easy to add ingredients, instructions, and even videos. Users can also rate recipes and you can sort your highest rated recipes. It uses a two column traditional blog layout with support for custom background and custom logo upload. It works out of the box and all theme options can be easily setup with live customizer. 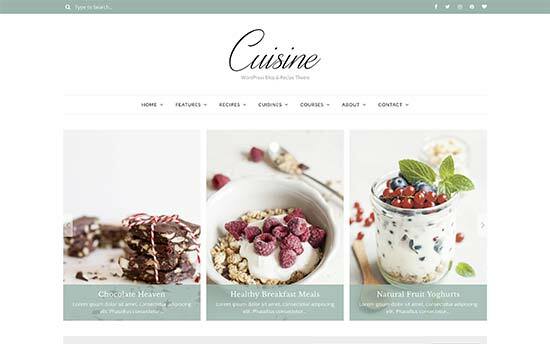 Cuisine is a stylish WordPress theme made specifically for food and recipe websites. It ships with a custom recipe plugin that allows you to easily add and manage your recipes. Each recipe has its own dedicated recipe card which can be placed onto multiple pages or posts. It includes two different layouts, multiple page templates and header styles. It includes custom widgets, unlimited color schemes, beautiful featured image, and more. 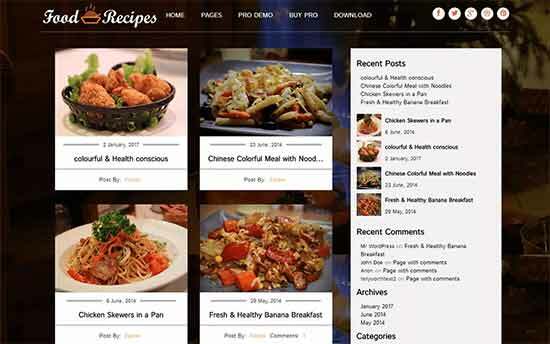 If you are looking for a free WordPress theme for recipes, then check out Food Recipes. It is built on bootstrap framework and features a two column layout with right sidebar. The content area is also divided into a two column grid on the desktop and a single column layout on mobile. It includes support for custom logo upload, social media menu, fullscreen background image, and more. It is quite easy to setup and can be easily used to quickly start a blog. 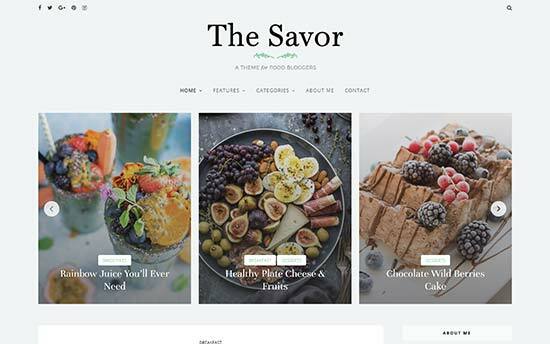 Savor is a fresh and clean WordPress food theme with lots of features for recipe blogs. It comes with multiple layout combinations in two and three column grid layouts. It also includes a custom recipe card which can be added into any WordPress posts or pages. Other noteable features include a featured content slider, custom widgets, social media integration, unlimited colors, contact form support, and more. 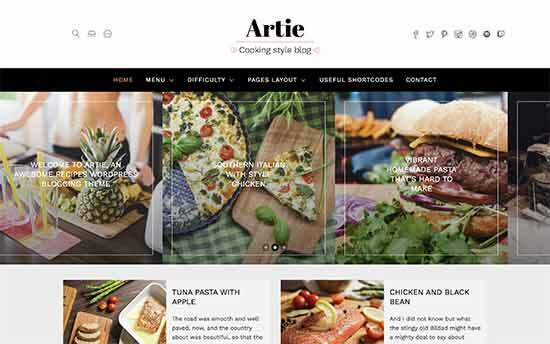 Artie is a highly customizable WordPress food blog theme. It comes in multiple colors with multiple layout combinations, widget ready areas, and different styles. It includes support for photo galleries, video galleries, recipe shortcodes, icon fonts, and more. All theme options are neatly organized and quite easy to setup. 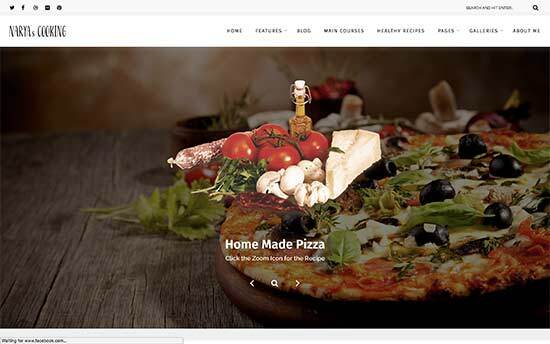 Pepper+ is an all-purpose WordPress theme with several turnkey designs including one for a food/recipe website. It takes a modular approach to design and comes with different modules that you can just drag and drop to create different layouts. Pepper+ is ready for WooCommerce and can also be used to create multilingual websites. It offers beginner friendly user experience with simple 1-click installers and quicker theme setup. 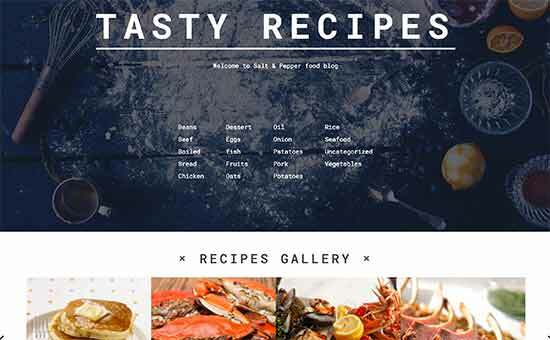 Salt and Pepper is an elegantly designed WordPress theme for food and recipe websites. It has a beautiful recipes section, which allows you to easily add recipes. It includes beautiful templates to display those recipes with category based filters. For page editing it ships with a visual page builder and slider plugin. It is translation ready and can also be used on multilingual websites. 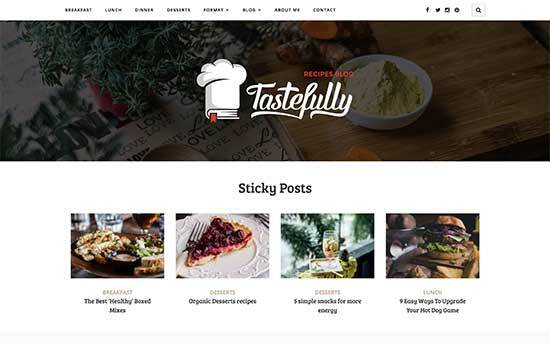 Tastefully is a modern WordPress blog theme for food lovers, restaurant reviews, and recipe websites. It features a large custom header followed by two-column layout with sidebar on the right. Other features include custom author bio box, social sharing, large featured images, and crisp typography. It is quite simple and works out of the box with minimal setup. 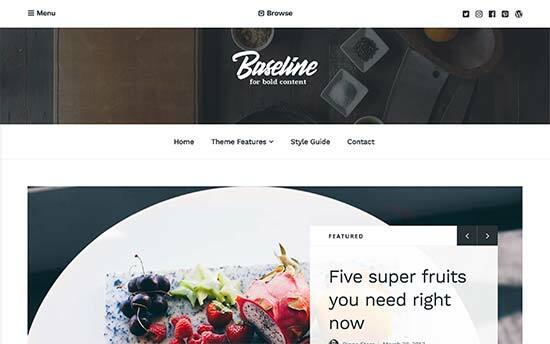 Baseline is a magazine style WordPress blogging theme. It features a beautiful featured content slider on top, which is followed by your most important content. It focuses on gorgeous display of your images and crisp typography to offer an elegant user experience. It is quite simple to use and doesn’t include any clutter. Inside you will also find a theme-setup guide that will help you get started right away. YumBlog is a powerful WordPress recipe theme that ships with a premium WordPress recipe plugin. It allows you to add, manage, and share recipes from your website. It can also be used to allow your users to add their own recipes. It features a nice modern layout focusing on images make your food photos look amazing. It ships with Beaver Builder to easily create page layouts using drag and drop tools. 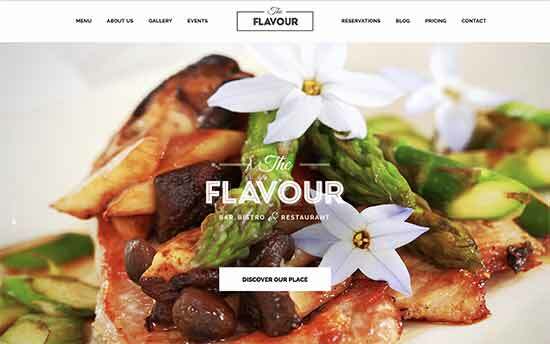 Flavour is a well-crafted WordPress theme for restaurants, food, and recipes. It includes beautiful restaurant menus, food icons, custom colors, and custom fonts support. It is super easy to setup with 1-click demo content installer and a fully integrated visual page builder. 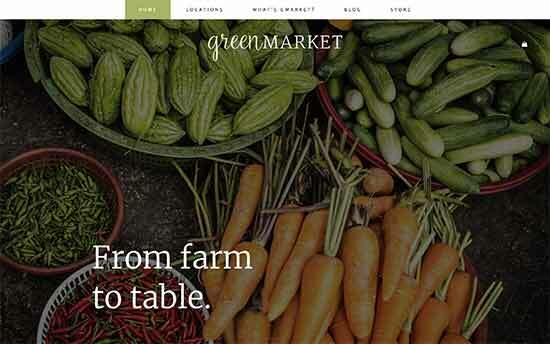 You can try different layouts and styles to create a truly unique experience for your website. 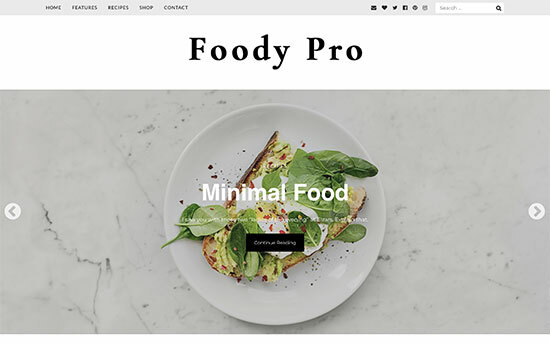 Foody Pro is a beautifully designed WordPress theme for food bloggers and recipe websites. This elegant theme features gorgeous typography and a clean spacious layout. It uses a lot of white space which makes your images stand out. It is WooCommerce ready, comes with an Instagram widget, and includes an automatically generated recipe index. It works out of the box and all theme options are beginner friendly. We hope this article helped you find the best WordPress themes for recipe blogs. You may also want to see our ultimate step by step WordPress SEO guide for beginners. I would like to know what social sharing plugin are you using for your blog posts? I would like to use the same. It is a custom plugin written specifically for our own websites. However, you can achieve the same appearance and functionality using one of these social media plugins.